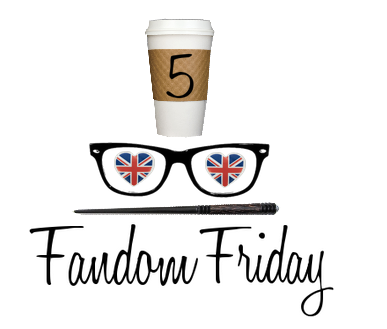 I am so pleased that 5 Fandom Friday is still alive and kicking and we’re starting off 2015 with a new post about our fandom resolutions! I feel like I’ve been writing best of and resolution lists for days now but this one was a lot of fun to think about. Megan and I also have a special treat at the end of our posts today, which is the 5 Fandom Friday topics for February and March!! I hope everyone is enjoying our topics and will continue to participate through 2015. 1) Re-read all of Harry Potter and Lord of the Rings – I briefly touched upon my intention to re-read more books I enjoy in my 2015 resolutions post but more specifically, this is going to be the year I re-read Harry Potter and Lord of the Rings. I have re-read Harry Potter more times than I can count as a child and it was always so enjoyable to do so that I want to make the time to experience them again this year. In April, Andrew and I are going to Lincoln Center to see all three Lord of the Rings films with the music performed by a live orchestra so I think a re-read is the perfect way to get excited for it! 2) Play more Board Games – I have always been interested in learning and playing board games but I never had anyone who wanted to play with me. Luckily, my boyfriend is rather into games and he and his friends love planning board game nights. I’ve already learned and played more games in the past year than I have, well, ever, but I want to continue to see what else is out there and working on my strategic skills. 3) Go to more Conventions – I went to SO many conventions between 2012-2013 and in 2014 I was a huge con slacker. It was partially because of moving and starting a new job (read: moving costs and no vacation time), but now that I’m settled I’m really looking forward to planning a trip. Even though I’ve been to Orlando a ton of times, I would love to go back with Andrew so we can see the new Diagon Alley expansion at Universal and enjoy fireworks at Disney together and such (and visit Kristin!). So maybe we’ll plan for a MegaCon/Harry Potter World/Disney trip in the near future? I would also love to attend ECCC, C2E2 (for the second time), and Baltimore Comic Con (because it’s my FAVORITE). 4) Cosplay – There are two characters that I am dying to cosplay and both will involve A LOT of work and preparation. I hate revealing my cosplays until right before the convention or the actual day of, so I’m not going to list them here but man I am really hoping I can make these two happen. My favorite cosplay of 2014 was the Kiki’s Delivery Service characters that Andrew and I did together at NYCC. 5) Hang my art prints – Another side effect of moving is that I haven’t had the chance to determine which art prints I want to hang on my walls yet. I loved my old setup at my parents house, but I think want to be more adult and get some of the really special ones framed before I hang them. I’ve acquired quite the collection of prints throughout the years and for the pieces I don’t choose to hang, I’ve been meaning to buy these portfolios that Amy suggested to me one Skype date ago so I can browse through and appreciate what I own instead of having it all sit in a plastic sleeve in my closet. The Lord of the Rings live orchestra sounds amazing!! Me too! I’m not at all biased but it’s the absolute BEST! You totally have to! Especially since you’re getting to go on the Harry Potter Studio Tour soon! I will be living vicariously through you! I love all of these resolutions! And your Kiki is adorable! Love the Kiki cosplay. You guys look so cute! I also plan on rereading the HP series. It’s been awhile since I have so I figured I’d give it a go sometime this year. Try Ticket to Ride if you haven’t yet. It’s a favorite game of my family and friends! Can’t wait to see your cosplays. I’ll keep my fingers crossed they work out for you. I know that feeling well. I agree – Ticket to Ride is so easy to learn and really exciting to play! They have a great mobile app that helps you learn the game and helps while away the hours on the train during your commute – strong recommend! Andrew was addicted to that app for a while! I haven’t had a chance to play Ticket to Ride yet but it’s near the top of my list! Thank you!!! My roommate actually just gave me a pattern last night as a belated Christmas present for the one I want to do most so I really hope I can make that one happen! I haven’t played Ticket to Ride yet but everyone keeps saying how great it is! I actually played Zombicide on New Years and it was a lot of fun! I’ve been wanting to pick up Rampage and Ticket to Ride. I need more board gaming friends. I’m also trying to attend more cons but I want to try local ones to support them! Yes! Local ones tend to be so much more fun than crowded ones (unless you have a specific thing in mind that you want to do)! They’re more low key and it’s easier to see everything instead of spending an hour trying to get from one place to the next! Our lists are a little similar! I’m also going to read Harry Potter, and I’m looking for more people to play board games with me! Good luck on your goals! Thanks, good luck on yours too! I hope you play all the board games!!! AHHH that’s so exciting!!! Which book are you up to in LOTR?! Your Kiki’s Delivery Service cosplay is so. so. so. charming! On of my goals is to re-read the Lord of the Rings trilogy too. I LOVED the movies when I was in middle school. So much so that I bought all the books…and tried to read them. They were so dense, and I had the attention span of a fly. Oddly, I really enjoyed the Hobbit though. Anyway, I’m hoping now that I’m older I’ll be able to appreciate the LOTR books more. We’ll see. Thank you so much!! Kiki is my favorite Ghibli film <3 And I totally know what you mean about LOTR! They were much harder for me to get through than The Hobbit! Great list! I love that Spider-Gwen print, by the way! Thank you! 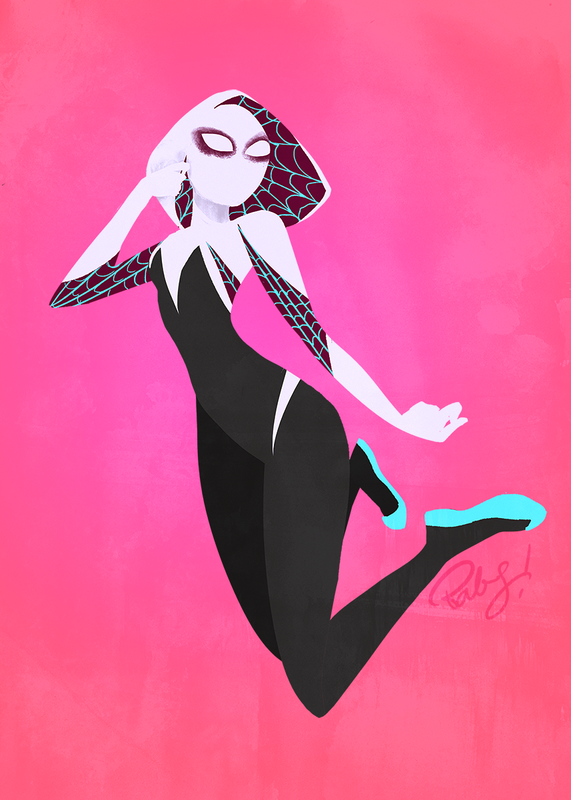 I am so obsessed with Spider-Gwen art. I can’t wait until the series debuts so there will be more to buy at conventions!